Here we have a great little zombie game made by One Chicken Army which will provide hours of fun. Zombies Ate My Doctor is your typical endless runner game, but with a twist – you have to shoot your way through hordes of zombies in your hospital bed. Upon launching the game you are presented with the controls in an easy to view screenshot. The controls are extremely simple and only add to how easy it is to just pick up and play this game. 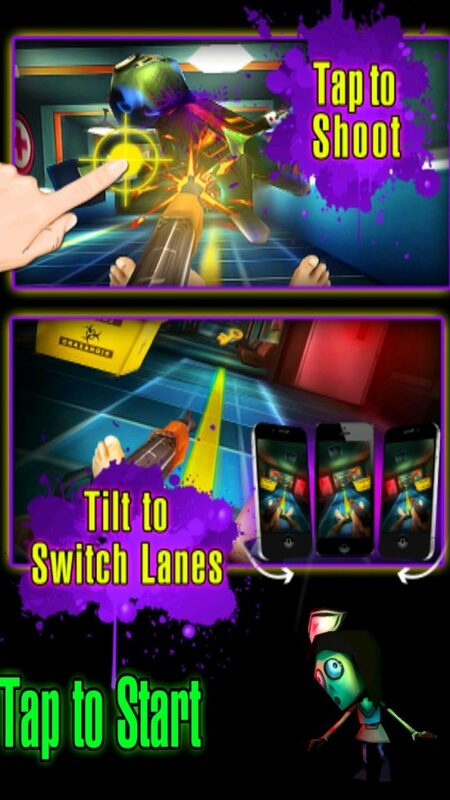 You simply tap to shoot and tilt to switch lanes in your hospital bed. 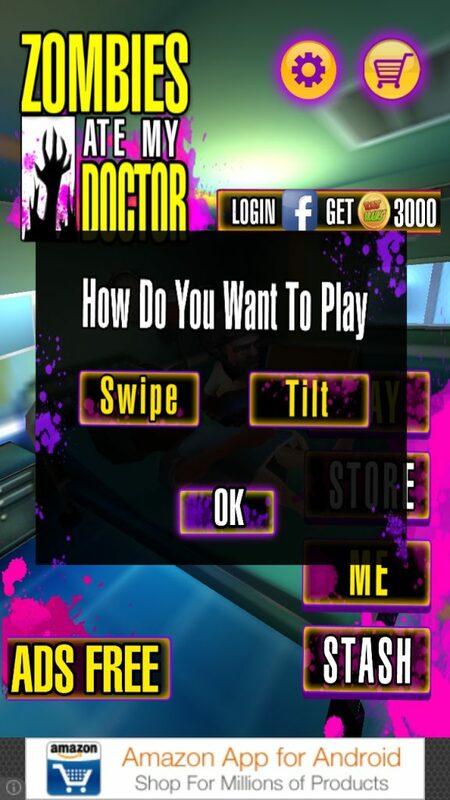 When hitting play on the main menu, you are presented with the option of choosing either swiping or tilting for your controls. Personally I found tilting a lot easier to use, and more fun to be honest, but swiping works just as well. Before getting into the gameplay, it’s always worth checking out the upgrades store to see what you’re playing for. 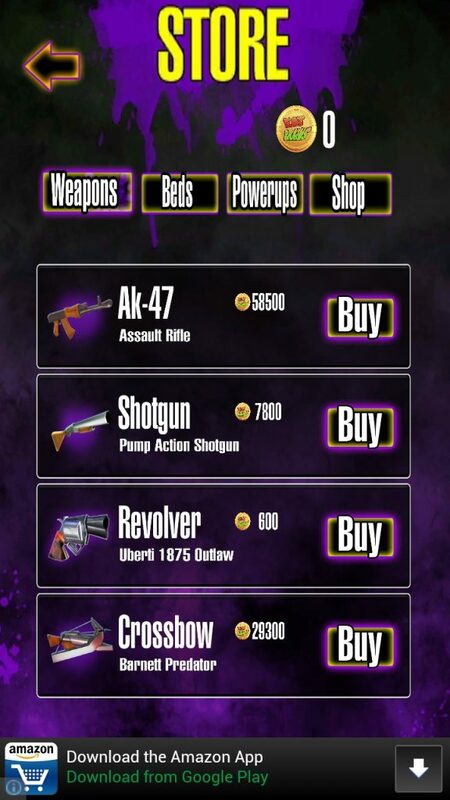 In this case you can trade your hard earned currency for better weapons. Getting right into the gameplay and you’re propelled into a hospital filled with zombies where you view only your legs and a wielding weapon. The zombies come towards you and you have to tilt or swipe to change lanes in order to tap and shoot them to clear your path. Of course you can always change lanes to avoid them, but that tactic definitely won’t get you too far. Your health is displayed in the top left hand corner as well as your coin count in the top right used to unlock cool weapons and power ups. There are also achievements built into Zombies Ate My Doctor which unlock as you progress. What I especially liked about this game are the various power ups you can get whilst progressing through the endless level. In the above example I’ve got a football helmet where I can just power through any oncoming zombies. I also liked the nuke where it will annihilate any zombies in my vicinity. I found myself not only reviewing Zombies Ate My Doctor, but also playing it as it is so enjoyable. It is the perfect blend of endless running and first person shooters. Zombies Ate My Doctor is available for Free in the Google Play Store.